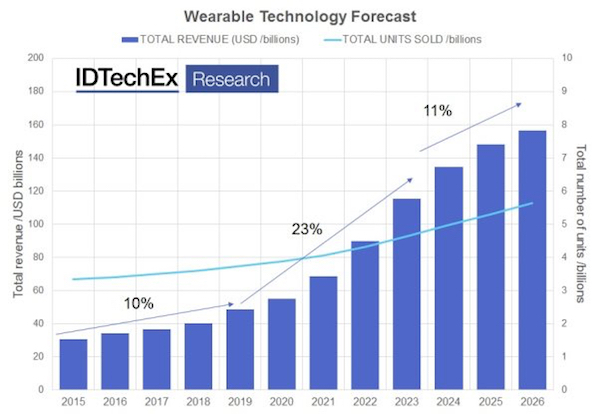 Although wearable technology will continue on its growth trajectory in the next 10 years, commoditization is destined to shake up the marketplace and product form factors will change rapidly, according to a new report from IDTechEx (Cambridge, UK). The market is currently worth more than $30 billion, writes the business intelligence firm in Wearable Technology 2016-2026 , with more than $11 billion coming from smart watches, fitness trackers and related newly popular products. By 2026, it anticipates that the wearables market will be valued at more than $150 billion. Fueled by a frenzy of hype, funding and global interest, wearable technology was catapulted to the top of the agenda for companies spanning the entire value chain and world, writes IDTechEx in a press release announcing the report, and this investment was manifested in hundreds of new products and extensive tailored R&D investigating relevant technology areas. 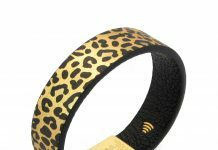 As the hype ebbs, however, many companies are now progressing beyond discussing “wearables” to focus on the detailed and varied sub-sectors, according to IDTechEx. The report outlines a long-term case for wearable communication devices ending their dependency on other electronic products. Most smartwatches and many fitness trackers still rely, at least partially, on a connection to a smartphone hub, notes IDTechEx. “The ubiquity of the smartphone as a central platform has been a key enabler for growth in wearables so far, but all of the largest manufacturers now look to a future, where the hub itself may become wearable,” explains IDTechEx Technology Analyst James Hayward.